Stay Informed. Be More Effective. Assess student understanding with automatic grading that instantly populates in a customizable gradebook. Leverage question banks, control access, and randomize test orders for maximum flexibility. 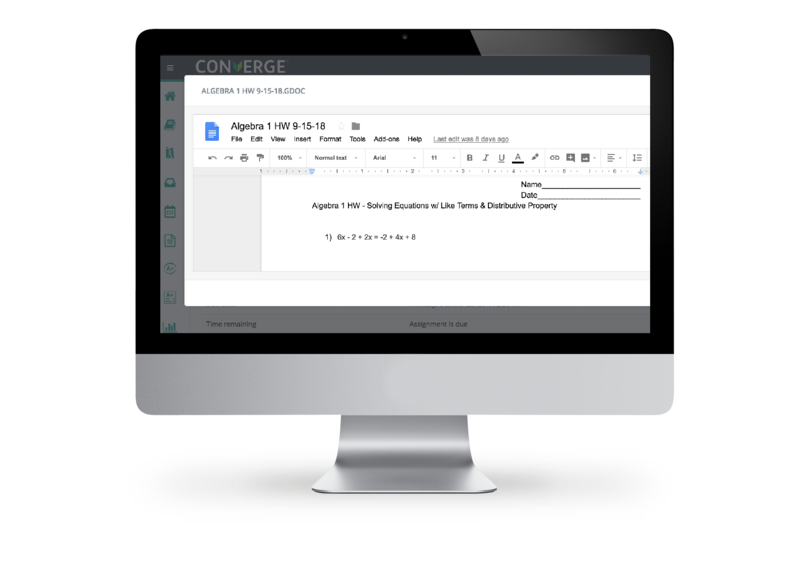 Converge's Power Grader feature streamlines the assignment grading process with commenting and PDF annotation capabilities delivered instantly to students. If you're a G Suite for Education school, you'll love how easy it is to post, view, edit, comment, and grade Google Docs without ever leaving Converge. Performance reports at the course and student level are a click away, providing valuable insight on student understanding and building confidence for instructional next steps. Make data-driven decisions with a comprehensive set of analytics at the system, course, teacher, and student level. Visualize important participation data, analyze assessment results, and generate district-wide reports to mold academic initiatives. Gain a birds-eye view of school and district performance with custom reporting features to track usage, engagement, and data that matters most to you.